L.E.I. Communications – A Division of Lodging Electronics Inc.
L.E.I. Communications has solutions for Business Communications Systems, Digital and VoIP (Voice over IP), Video over IP Surveillance for the office, Unified Messaging applications, and IVR / Call Center applications. Also offered is voice and data cabling, cabling design and infrastructure planning with certification of existing and new cabling runs to insure the best performance for the customer's network. Check out our Products and Services page for our full line services and hardware that we can offer to you. Tadiran Telecom designs Digital, VOIP, and Unified Communications solutions. 2010 marked the 50th anniversary for being in the telecommunications business. You know the old saying that big things can come in small packages well Tadiran delivers just that with the UCX VoIP system! Same feature set as the larger PBX systems but in a 1U rack mountable case. Includes the Seamail unified voicemail and is a great fit for companies with 5 to 120 users! 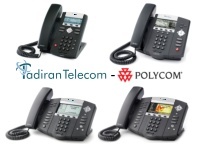 Tadiran has partnered with Polycom to bring a high quality and versatile SIP based telephone to it's product line. Check out the brochure for additional details.